Anyone interested in politics should take a good look at the Political Compass website. Here you can read about Left vs Right (economics) and Authoritarianism vs Libertarianism (social attitudes) and see how you fit into the big picture. There’s a relatively simple test to take, and here are my results, shown with the positions of the various UK political parties in the 2015 general election. It seems like I’m a political outsider, although not an extremist. That’s me in the bottom right corner. No wonder I can never find a political party that I really agree with. The Political Compass website has a lot of very interesting facts and explanations, some of which I want to share with you here. I would like to thank fellow blogger nannus for bringing this fascinating website to my attention. You might have the impression that Europe is a kaleidoscope of differing political views, with governments of diverse hues. Wrong. If you’re American, perhaps you think that Europe is a hotbed of god-damn socialists. Wrong again. 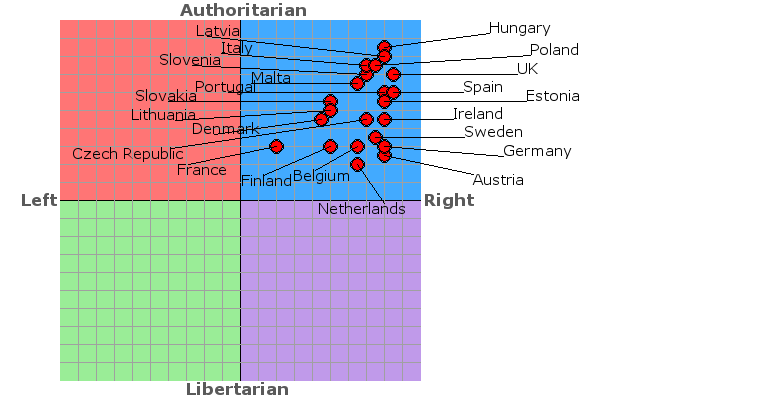 Viewed through the prism of The Political Compass, all European governments are right-wing authoritarian – even the Nordic countries. It seems that most of the political spectrum is completely off-limits in modern Europe. If you want to get elected in any European country, you’d better be sure to endorse free trade, moderate taxation and be rather restrictive about what people are allowed to do with their free time. What about America? Here are the results for the 2012 US Presidential elections. Same thing really, but with an even narrower spread of views (apart from Ron Paul, who seems to live in a world of his own.) If anything, US politicians are rather more right-wing and authoritarian than European leaders. If nearly all Western governments are in the right-wing authoritarian corner, who is in the other parts of the graph? So Stalin is in the top left, with a clear policy of no freedoms – economic or social – for anyone. Remind me again – who voted for Stalin? Oh yes, absolutely nobody. Also in this corner are Mao Tse Tung and Pol Pot. In order to remain in power, Stalin killed between 34 and 49 million people (apologies for the imprecise statistics, but what’s a few million between friends? ), Mao killed between 45 and 78 million, and Pol Pot killed a rather paltry 1.7 million. Pol Pot was in power for just 4 years though, so he had only just got started. We should be in no doubt that left-wing authoritarian governments are seriously bad news, and do everything we can to avoid them. Left-wing Libertarians like Gandhi are a different matter. They love everyone, and believe in a kind of voluntary collectivism. Good luck with that, you bunch of hippies. No one’s going to vote for you. In the bottom right we find no political leaders whatsoever, just academics. It seems that the notion that people should be free to do broadly what they like as long as they don’t hurt anyone is never going to win any popular support. We’d much rather tell our neighbours what they can and can’t do, even if that means that they impose restrictions on us too. The website also examines the idea of right-wing extremism. It points out that this is a complete misnomer. Most fascists are economically left-wing or centrist. Hitler, Mussolini, the British National Party and the French Front National are all to the left of mainstream parties. Indeed, NAZI stands for National Socialists. The bad boys of politics are not right-wing, but Authoritarian. So nearly all democratic governments can be characterised to some degree as right-wing authoritarian. Furthermore, there appears to be an inverse correlation between economic and social liberty. Countries that lean to the left economically tend to be more socially permissive, while those that allow greater economic freedoms tend to be more socially conservative. In France, you can do whatever you like in the bedroom, but have to obey lots of rules in the boardroom; in the UK, you’d better not frighten the horses, but you are free to buy and sell them at whatever price you like. Why do we feel the need to impose so many rules on each other? I don’t know. Perhaps we’re all bastards. But why not combine the best of both worlds – economic freedom and social freedom too? Sounds good to me, but it will probably never catch on. This entry was posted in Politics and tagged Belief, Democracy, Economics, Free trade, Freedom, Human rights, Politics. Bookmark the permalink. That’s exactly where I expected you to be. You’re a hippy and I’m an idealist, and neither of us are ever going to be represented by mainstream political parties. I would be happiest in The Netherlands, and you should move to France! Hmmm. 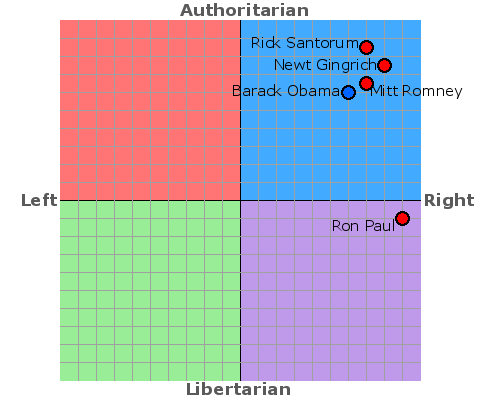 As I mentioned on another thread, I’m at about the same position as you on the authoritarian / libertarian axis, but slightly to the left of the center line on the left / right axis. I’m a little suspicious of the graph that groups every government out there into right wing authoritarianism. That smells like something put together by somebody who simply refuses to hear anything about the actual logistics of governance. Well, there are a lot of people who claim that political parties are all the same. Maybe they are right to some extent. The founding principle of the EU is free trade within its borders, so that puts all EU countries to the right of centre. All EU countries support a welfare state, a mixed economy, monetary controls, and moderate taxation. Just how different are they? Certainly no European country has a government that remotely resembles the old Soviet Union, or the ideals of Gandhi. So democracies that permit free trade, provide social safety nets, a mixed economy, and moderate taxation, are “right wing authoritarian”? Regardless of my test results, I suspect that site would consider me an authoritarian. i share the skepticism about the test… The grouping of American politicians is suspicious, plus Hitler’s in the same quadrant, and not far off. I’ll have to take the test when I get a moment… be interesting to see where I fall. I’m surprised at the negativity from Wyrd and Mike. These results make perfect sense to me, although they initially surprised me. Thanks Steve, but the FAQ doesn’t change my perception that their assessment of current parties, leaders, and governments is too skewed to derive anything interesting from it. It’s worth reading their justification of why Barack Obama is a right wing authoritarian. That justification, tarring Obama with positions he is adamantly opposed to, removed any credibility I might have given the site’s assessments. I imagine that you are in the bottom left corner, Hariod. It’s the top left that’s naughty. On Ghandi’s elbow (their graph) in the Left Libertarian quadrant. Hmm. My test result reveals that I’m somewhat more left and libertarian than I thought: -8.65 on the authoritarian/libertarian axis, and -4.75 on the left/right axis. In principle. I support economic freedom, but I suspect my distrust of big business/multinationals exposes that I’m not yet ready to embrace Laissez-faire economics. I’m less concerned about the drift from left to right over the last 10 years as shown by the charts, as by the slow drift towards authoritarianism over recent years. Democracy isn’t threatened by movement left or right, but authoritarianism on the other hand is a definite threat. Barry, you’re probably correct that there has been a shift towards authoritarianism in recent years. I don’t know why – perhaps terrorism and harsh economic times has done this. Perhaps it is simply the degree of change in the world. 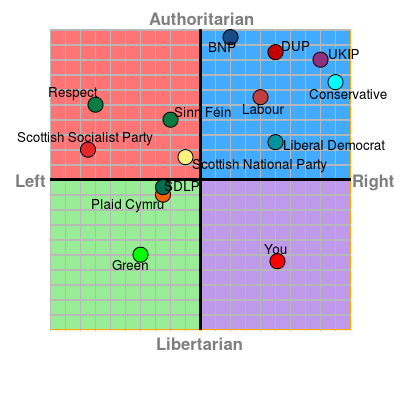 Which suggests I’m more centrist, but also more libertarian, than Gandhi. As a rough cut first approximation, that’s probably fairly close, but it leaves out so many nuances that it’s just an interesting data point. The thing is, my actual position is a lot more all over the map than that single dot represents. One thing I noticed is that the test forces you to take a stand, there is no possibility of a neutral answer (and mine were “no opinion; don’t care” in several cases). Being forced to pick a side when one truly doesn’t have a side seems like it must skew the results. I suppose my bottom line is that labels are useful for discussion, but when they are used for pigeonholing, I always feel like important information is being lost. The reason the test doesn’t allow you to choose “no opinion” is to prevent people from skipping questions that they haven’t really considered. Many tests handle that with a “Don’t Know” category that excludes the question from consideration. A problem with their tactic is that I was truly 50/50 on several questions. Look at it this way: how well can you characterize something as complex as a social-political position with only a couple of dozen (rather basic) data points? The data resolution there is pretty coarse. That said, when pressed, I generally label myself a centrist libertarian, so it did peg my basic views reasonably. I’m just not a fan of analysis that reduces a complex thing to a single number (or even two, as in this case, but two is definitely better than one). I found this topic interesting so I went off and tried the test. I was rather surprised to find myself down keeping Gandhi company in the bottom left-hand corner. I found the test interesting too. I’m libertarian-left leaning (same as Green Party) and agree that ‘far-right’ politics are misinterpreted and are really authoritarian. I would class Hitler as authoritarian-left because economically his party was a socialist party with a central planned economy. Good post. The use of the term “far-right” to describe fascists, authoritarians and racists always annoys me because it implies that the moderate right shares watered-down views on those issues. Thanks for reading and agreed! I got a -5.0 for economy and -4.6 as libertarian. I have a hard time agreeing with those numbers. I definitely lean toward down-left, but not to this extreme. I feel the questions don’t really cater to my thought process, as I have very specific reasons for each of the questions (except the “some people are naturally unlucky” question, which I don’t think should be included). Ultimately what I want is an authority that is not morally, culturally, or religiously biased. And, I want judgment, laws, and their enforcement to be more localized. * Competition without interference, which promotes progress. * Being objectively and inherently superior, such as being an athletic 7ft tall person trying to be a professional basketball player. Hi Peter, thanks for your comment. Most people who have left a comment here seem to be in the economically left, socially libertarian corner. That seems freakishly unlikely to me. I don’t know why my post has attracted such responses! I wasn’t sure what you meant by your last paragraph. Are you for or against competition and tall basketball players? I’ve noticed the same thing as you. What I meant in my last paragraph is that I’m pro-competition (as long as competition does not mean intentionally crippling your rivals) and I feel whoever is the most qualified for the job gets hired (where age, gender, race, ethnicity, etc cannot be deciding factors unless there are objective reasons otherwise). The way I see it, that’s a bit of a gray area between left and right. I feel my views are leftist in the sense there are handicaps on capitalism and markets, and there are certain freedoms involving prejudice removed in order to achieve equal opportunity. I feel my views are rightist in the sense I want businesses to thrive by any means necessary (again, as long as they’re not sabotaging rivals), and that the greatest success only comes to those who are qualified and have earned it. Does that help clear things up? Does you think I sound like I am as economically left as the test suggests? I don’t think you sound particularly left at all. Competition only works in a free and fair marketplace. Hiring the best qualified person is rational and exactly what should happen in order to maximise economic performance. I look at it this way. The original meaning of “market” was a place where sellers gathered in a town or city to sell their wares. In order to make the market work effectively, it was necessary to introduce standards of weight, money, etc. It was necessary to prohibit practices such as diluting beer. It was necessary for products to be clearly identified. It was necessary to fine traders who sabotaged their rivals. These regulations didn’t handicap the market – they enabled it to thrive. Regulating markets to make them run better isn’t leftist. Haha so it seems you agree that it’s a bit weird I’m considered a -5 on the economic scale. Like I said though, I do still think I’m left-leaning, but maybe more like a -1. Once you get into things like taxes, I start to sound more leftist. I mostly agree with your points, though I think competition can still thrive without a wholly free market. The regulations you speak of are more about being honest and reliable about the product/service, which I totally agree with, but I was thinking more in line of how competition deals with each other at a business level. Intel is notoriously anti-competitive, where they have bribed reviewers, had misleading advertising, and effectively blackmailed companies to prioritize them. If they can’t get their way, they buy out their competitors. There’s nothing really questionable about their products, and they’re not directly meddling with their competitor’s products either. Instead, they’re basically forcing people to opt for their product, regardless of whether alternatives are better or not. They are borderline monopoly. This is what happens when the market has too much freedom, and is the sort of thing I want restricted; I don’t want Intel to go away, I just want them to stop playing dirty. Does that make sense? BTW, it’s refreshing to have political discussions without people getting heated over it. I don’t know about Intel, but the payment of bribes, misleading advertizing and blackmail are all illegal under current laws and have been for as long as I can remember. I don’t think there’s any disagreement between us there. Companies like Apple, Google and Facebook are borderline monopoly organizations and clearly need regulating to stop them abusing their market dominance. Again, I don’t disagree with you. As you’re probably aware, it is relatively common for wealthy corporations to exploit legal loopholes (Microsoft is probably the most famous for this). For example, tax evasion is something most wealthy companies have figured out and still exploit today despite it being unlawful in most countries. Haha I think I’m a bit beyond closet capitalist – I admit I’m pro-capitalism. I don’t believe there’s anything inherently wrong with corporations, though, I do feel some corporations are “evil” or corrupt. I guess the one thing I want to inhibit in capitalism is anything that has to do with greed. I want companies to strive to be the best for the sake of principle or pride in their product/service, not for wealth. Wealth should be a side effect of doing a good job, rather than the primary objective, and things aren’t handled like that today. I am strongly against those who are disproportionately wealthy to their organization, and those who don’t give [enough] back to society. I have good examples of this and solutions I feel would fix this, but I’m rambling enough as-is. I am also in-favor of taxes paying for things like basic universal healthcare, certain forms of education (but not all education), criminal rehabilitation, welfare for the handicapped/disabled, welfare for the unemployed who do community service, etc. I feel the government is responsible for getting people to remain safe, healthy, and most of all, prepped/capable to contribute to society. I think this is why the test made me out to be so leftist, even though I feel I’m relatively restricting compared to socialists. Do you think this these things override my capitalistic views? Well it has been argued that a successful business that generates profit can use that profit to reinvest, and can attract inward investment. This enables it to grow and do more of whatever economic activity generated the profit – providing goods or services to its customers. Companies that do not generate profit ultimately go out of business, or are taken over by better-managed companies. The net result is economic growth, better employment opportunities and a higher standard of living. Tax evasion. This is illegal, of course. Perhaps you are referring to tax avoidance? The 1%. Yes, that marks you out as left of centre 🙂 In the UK the top 1% of earners pay 27% of all income tax. Does that qualify as “giving back enough to society”? If not, how much should they pay? By comparison, in the UK, the lowest-earning 44% pay zero income tax. There has always been a 1% and always will be. Any wealth distribution that is not exactly equal will necessarily be unequal. I would like to clarify – I’m fine with companies being hugely profitable. If investments or mergers with other companies results in improving their product/service, I think that’s great. I guess a better way to state my point is I want companies to prioritize customer satisfaction, and preferably employees too; I don’t want board members and stockholders being the #1 priority. All too often, the investments are for “patent trolling”, and mergers are to absorb their competition rather than attempt to compete against it, which stifles progress. A successful business doesn’t require happy or approving customers/clients. To me, it doesn’t really matter whether it’s tax evasion or avoidance – whether it’s illegal or just frowned upon, a lot of people will find how to do it. If you google “cases of tax evasion in ” you’ll find several recent articles, often court cases. So, the 27% tax you speak of may be required, but may not always fulfilled. You bring up a great point though – is 27% enough? There’s no a simple answer, because you have to take into account what that money is going toward, whether there’s enough of it, whether the people actually want it, and if the results pan out. So take Denmark for example – the average citizen has a staggering 45% tax rate, and Denmark often ranks within the top 5 happiest countries in the world. On the other hand, Switzerland has some of the lowest tax rates in the world (for individuals) of somewhere around 8% and they also often rank in the top 10 happiest. I’m not too fluent in how their governments work, but from what I understand, Denmark leans very socialist while Switzerland leans very capitalist (I’m not implying those are opposites, BTW). I’m not going to pretend I know what’s happening here; I have my ideas, but nothing I feel confident in. It’s an interesting correlation, though. And yes, you’re right – the 1% are never going to go away, even if I lived my ideal government. OK, so, you don’t want companies to treat stock holders as their #1 priority. Perhaps you are ignoring the fact that the stock holders own the company. Do you own a car or a house? What if the government mandated that you lend your car to someone else one day a week, or allowed other people to share your house? Would there even be any point owning the car or house under those conditions? In reality, companies thrive when they provide good customer service, and they are only able to recruit and retain the best staff if they treat them well. There are strong economic incentives for companies to behave as you would like. Companies that don’t, get bad publicity, lose customers and/or staff and ultimately tend to go out of business. But only under free market conditions. We should be very wary of forces that damage competition – such as mergers and monopolies, as you point out. But also excessive government interference, even if the intention is good. On tax and the rich, the 27% tax burden that the 1% pay isn’t what is required. It’s what is actually paid. I personally have no problem with the existence of very wealthy individuals, provided that laws exist to prevent them from abusing their power. That is where the focus should be, not on the current emerging trend that seeks to strip the wealthy of the wealth. I know shareholders own the company and I see your point, but I think you’re taking what I say to an extreme that I also don’t want. I’m not saying shareholders shouldn’t be a priority (obviously, they need to be in order to have an incentive to do what they do) I just don’t want them treating their income as the only reason they’re in it. This tends to happen whenever a company is making sales just due to the name or product series alone. I don’t want them sacrificing quality/quantity in order to increase profit. I don’t want planned obsolescence or forcing people to buy more for a complete package, either. As I said before, if they become filthy rich because people like what they offer, good for them – I don’t want to stop that. There are a lot of people out there who own a business because they like what they do. Owning a business is not synonymous with selfishness. The video game industry is a good example of this. Electronic Arts is being pummeled by angry fans, because they’re releasing incomplete and sub-par quality games while introducing microtransactions, gambling, and other pay-to-win stuff. Their stock history directly correlates to this. Meanwhile, look at Markus Persson, whose net worth is $1.4 billion. This is just from him making 1 game. Nobody at EA comes anywhere close to how much money he has, and yet, I don’t have a problem with him, because he made something people wanted and he never screwed over his customers. All that being said, I too agree the wealthy shouldn’t be stripped of their wealth as long as they don’t abuse their power. But the problem is, most of them do/have. Because of their status, it’s too challenging to prevent them from getting worse. When people get a taste of real power, they can’t help but crave more, no matter how little they actually need it (or how much it may hurt them in the end). This actually comes full circle about why EA’s microtransaction system works so well, where the players get a rush when they pay a “small” fee to breeze through a set of challenges. I don’t know what the solution to a problem like EA’s microtransactions might be. Micro-regulation perhaps? I’m just teasing. Ultimately, if gamers continue to pay for these charges, they won’t go away. If gamers truly hate them, then ultimately EA’s revenue stream will suffer and shareholders will make them change the business model. The vast majority of gamers hate it. I mean… look at the ratings of Star Wars Battlefront 2. The problem is the minority of people who are really into gambling. It’s not unheard of for a single person to spend $500+ on even a crappy phone game. A lot of governments have been trying to curb this by calling it gambling. Obviously, that only works where gambling has restrictions. If this pans out, looks like this might actually be the end of MTs. A lot of game companies will go as far as to make blood green or blue in order to lower the age restriction. If gambling makes a game adults-only, that’s a death sentence for its sales. But yes you’re absolutely right – this problem otherwise won’t go away until it stops being profitable. However, the SWBF2 has proved to be unprofitable (I think EA lost $3 billion because of it?). So, there’s progress. My understanding though is that EA barely breaks even on the revenue from sales of its games. The company must have considered the option of raising prices, but decided that its customers would prefer the microtransaction option. Perhaps they were right? Another example: newspapers are struggling to stay profitable in the digital age. Readers could choose to pay for their news, or get free news – the downside being that they get bombarded with online adverts and the integrity of the news isn’t always reliable. But they choose the free option. Who’s to blame? The companies or the population at large? Do we get what we say we want, or what we secretly want? I’ve heard the same thing, but I have a very hard time believing them, when you consider their stocks, the amount of recycled code/content they use, and the amount of money they dump into experimental things like AI. Besides, their competitors don’t seem to be struggling so bad. Take CD Projekt Red for example, who is tiny compared to EA yet published one of the most liked games in the past decade for a single fixed price, and was hugely profitable for them. On top of that, they hardly attempt anti-piracy measures, and they offer hours of new free content. So, I can’t help but think EA is at fault here. Their sales suffer because they’re not making what people are asking for. EA used to create content people really liked and had a steady income years before MTs were involved. I think your example about the newspapers is a great one, and you pose a very interesting question. The tricky part about that is a lot of people don’t realize (or care) about the reliability of online sources. So, as unfortunate as it is, in my opinion, the population at large is who’s wrong. But, if the people like what they consume, I say the free online sources earned their crown as the winners in this case. Doesn’t mean that’s the way it should be, but if both the people and the content producers are getting what they [think they] want, that’s just an unfortunate reality we’d have to accept. Seems like we agree on many things, Peter, and that doesn’t happen too often in politics these days! Yes, it’s been nice having this discussion with you. Even where we aren’t on the same page, it’s refreshing this was kept civilized.